Kasumi knives are produced by Sumikama Cutlery in Seki, Japan. 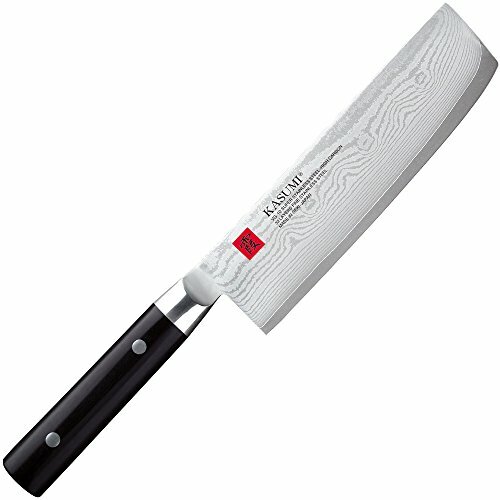 Sumikama Cutlery specializes in producing knives from the most advanced materials with the most advanced manufacturing techniques. Kasumi V-Gold No. 10 Damascus Pattern knives are made from 33 layers of stainless steel. Only the middle layer acts as the cutting edge, and it is made using V-Gold No. 10 stainless steel. V-Gold No. 10 is a high carbon stainless steel with cobalt, manganese, molybdenum and vanadium for added durability and ease of sharpening. The addition of cobalt to this steel requires special tempering in order to maximize the full benefit of this steel. Sumikama's technique for this special tempering is a closely guarded secret. If you have any questions about this product by Kasumi, contact us by completing and submitting the form below. If you are looking for a specif part number, please include it with your message.